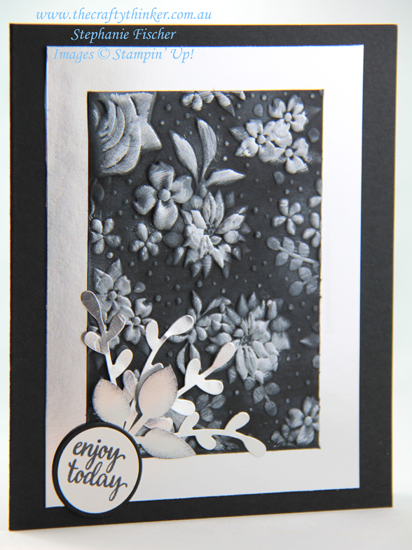 To start this card, I embossed some Basic Black cardstock with the Country Floral Embossing Folder (until 31 March FREE with a $90 purchase!). I then gently swiped a Whisper White ink pad over the embossed piece and let it dry. The white ink takes a while to dry, so this is an ideal opportunity to work on another project, go shopping or do whatever tasks you have on your to do list! 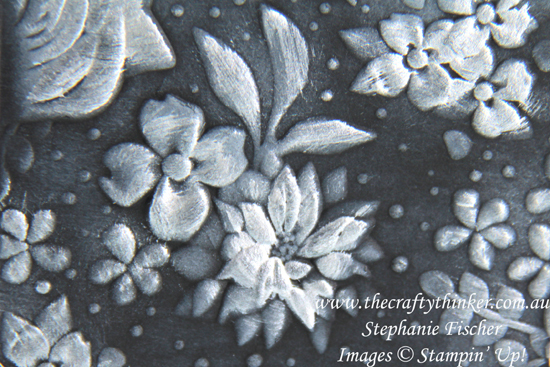 Once the ink was dry, I used a sponge dauber to gently add some Frost White ink to the flowers and foliage with the deepest embossing. I did this a couple of times. Try as I might - I can't get the shimmer to show up in my photos! Then I cut my piece in half to make two cards. Each piece has a silver frame and is adhered to a black base card. The sentiments are from the Eastern Beauty stamp set. I punched them out with a 1" circle punch and then added a layer of black card cut with the smallest of the Layering Circles dies. 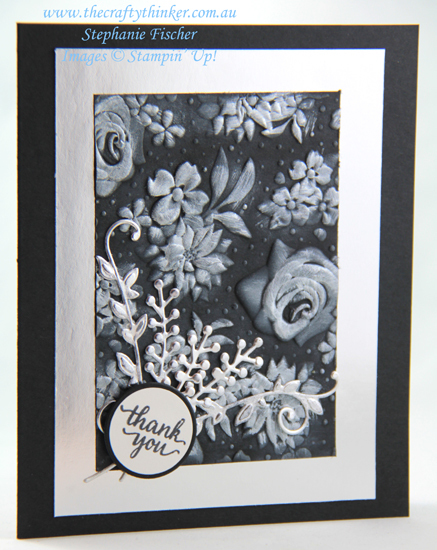 The foliage for the thank you card is cut from Silver Foil with dies from the Butterfly Beauty set and the foliage for the other card is punched with the Sprig and Leaf punches. Some of the foliage is sponged with Stazon Jet Black ink.